At Bagram Airfield, Afghanistan, there is a place that wants to know about your tactical problems. The forward team of the U.S. Army Rapid Equipping Force or REF, wants soldiers to bring their ideas regarding equipment on how to accomplish their missions more efficiently. REF’s mission is to provide innovative materiel solutions to meet the urgent requirements of U.S. Army forces employed globally, inform materiel development for the future force, and on order, expand to meet the operational demands. Its focus is on immediate-need materiel solutions at the small-unit level. “We try to paint that picture for them that you know there’s a lot of capabilities that reside in this building, in the organization,” said Lt. Col. Scott Cantlon, REF forward team chief. Cantlon is not new to this position as he has also spent time as the REF Forward Team chief in Iraq, Kuwait and Afghanistan for periods in 2016 and 2017. The REF team in Bagram offers the capability of rapid prototyping through the Expeditionary Lab or Ex Lab. The engineers in the Ex Lab are capable of taking a soldier’s concern, and if feasible, fabricating the solution through 3D printing, sewing, machining, or electrical work. “Three-Dimensional printing has come a long way in the last 10 to 15 years. Today we have 3D printers where you can drop a design on a computer, hit print and the next morning have a full made-out part that is of the same quality as a machine part in terms of tolerance and the cavities (compartments) it can do,” said Dr. Patrick Fowler, former lead engineer of the Ex Lab, who redeployed back to the U.S. Army Research, Development and Engineering Command at Fort Belvoir, Virginia, in late October. “And in fact, it exceeds what you can do with a machine because you can create spaces that you would never be able to reach with a tool,” Fowler said. Fowler has a bachelor’s, master’s and doctorate degrees all in mechanical engineering. Fowler volunteered for this deployment – his first – to fulfill a lifelong dream of serving in his own way with Warfighters. 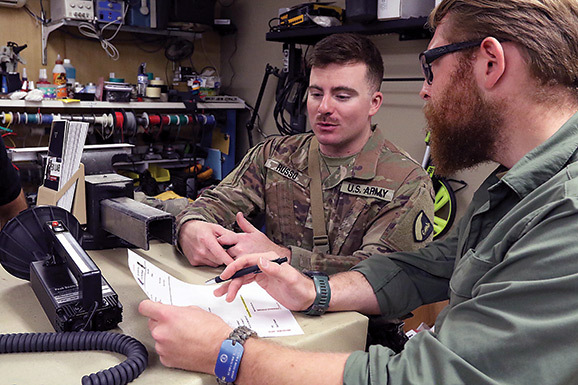 “This is the only job that I’m aware where an engineer can get a requirement directly from the Warfighter and give them something that goes out the next day on a mission and immediately get feedback, and be able to keep the Warfighter in the design loop,” Fowler said. The Ex Lab is equipped with design software and other limited metal bending capability among other things. And depending on what it is, these new products can be made in limited quantities to equip soldiers. “We make things that have never been made before to respond to a tactical gap,” Fowler said. The REF, headquartered at Fort Belvoir, Virginia, started in 2002 after soldiers realized the need for non-standard equipment to meet the demands of their wartime mission. The Ex Lab has reachback ties with the RDECOM for its expertise and additional manufacturing capabilities. The REF is the Army’s quick-reaction capability for getting urgent material solutions in the hands of Warfighters. It’s able to do this using a request document known as “10-Liner”, where soldiers capture the requirements and submit. Sometimes, the need is met with commercial and government off-the-shelf technologies. But when not available and if approved, the engineers will design and fabricate a solution to meet a soldier’s needs. Muzii has nine years total working for the REF’s reachback support element, Edgewood Chemical Biological Center’s Advanced Design and Manufacturing Division, whose headquarters is at Aberdeen Proving Ground, Maryland. He also has a bachelor’s degree in mechanical engineering and a minor in mathematics. As of November, Muzii will have been deployed two years to Afghanistan in support of the Ex Lab. The time to procure and deliver nonstandard equipment. REF’s goal is to fill a requirement within 180 days. The Ex Lab typically produces a solution in less than 30 days… sometimes in a few days depending on the requirement. Locations and manning requirements for the REF have varied during the last 16 years based on the missions and number of personnel in theater. The REF also has forward teams in Kuwait and Iraq. Since 2002, many new technologies have been equipped to help accomplish the mission more efficiently. Current projects include persistent duration unmanned aerial systems, electronic warfare, unmanned and counter-unmanned aerial systems, expeditionary force protection and so much more. “Honestly, practically all these projects [we do here] someone walks in on I never would have thought. I have no prior military experience… I’ve always been an engineer,” Muzii said. On January 30, 2014, the Army declared the REF an enduring capability. It now reports to the Army’s Training and Doctrine Command where it will continue to support soldiers deployed globally for years to come.